ACD FotoAngelo 2.0 - The slide show software and screen saver creator that lets you add sound, text and transition effects. Simple tools like the image ordering drag-and-drop storyboard area, make creating shows with this multimedia builder quick and easy. When you are done, you can save your project as a stand-alone program you can send to anyone by e-mail. Whether you want to get the whole family together in one room and impress them with a slide show of your latest vacation or send your slide show to a far away relative, ACD FotoAngelo slide show software and screen saver creator can make it happen. ACD FotoAngelo multimedia builder comes with an intuitive interface makes it simple to create impressive slide shows quickly. You'll enjoy a large image preview, thumbnail browsing area, storyboard and simple audio and transition effects selectors. 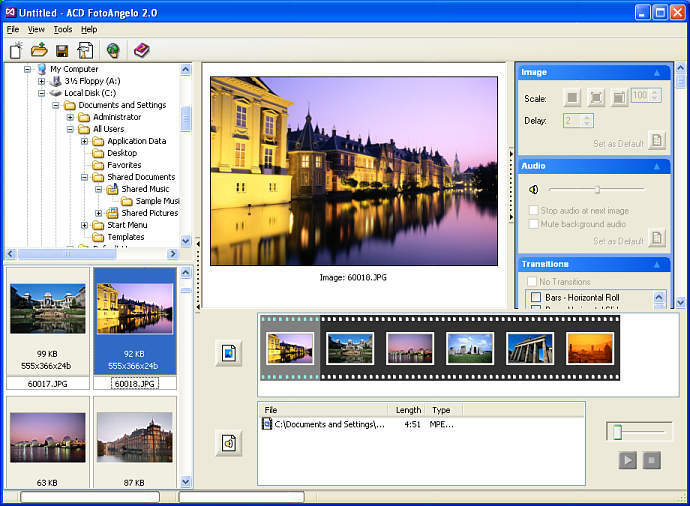 The stand-alone version of ACD FotoAngelo multimedia builder supports 13 popular multimedia formats, including: BMP, EMF, GIF, JPEG, PCX, PNG, TGA, TIFF, and WMF. Or, enjoy support for 40+ image and sound formats when you have ACDSee. With FontList, you can create a HTML file that will show all the fonts installed on your computer. With your browser, you can pick the right font in no time. Top Flash to Video Converter is a useful tool to convert Macromedia Flash SWF files to AVI, VCD, SVCD or DVD compatible MPEG files. Flash Creator is a quick and refreshingly easy tool for creating animated Flash logos, banners, intros, and headers. In just a few minutes, you can blend texts, vector objects and images into an engaging animation that will make your site shine. FONTKAT/WIN v3.0. (ASP) Builds font catalogs for WP/WIN 9, 8, 7 32-bit. Users select fonts they want to catalog along with point size &amp; text to use for font samples. The printed catalog shows what fonts REALLY look like. $20. Image Broadway lets you edit photos with 100+ filters, special effects, and tools, supports all popular cameras. It offers advanced image processing technologies while hiding beneath a user-friendly interface. It offers batch and automation tools. Folder Icon Changer is a software that search and replace the standard icon of a folder on any other icon. It is easy to use. You can change icons of folders quickly and freely just by clicking several buttons. This site does not contain serial number, crack, keygen ACD FotoAngelo serial number : serial number is the simplest type of crack. A serial number(cdkey,product key,etc) is register the program as you may already know. a crack or keygen may contain harmful software. If you cannot find the exact version you want, just give it a try. for more information read .nfo/.txt/.diz file include in zipped file.